She’s the first African-American woman to represent Massachusetts in Congress. He’s the first manager of color in Red Sox history. Both are blazing bold paths forward grounded in smart strategy. THE DYNAMIC BLACK WOMAN was well into her 40s and had been working in the trenches of government for years when she shocked the nation with her historic election to Congress, yet that didn’t stop people from labeling her an overnight sensation. She commanded attention by defying the odds, having taken on the establishment of her Democratic Party as much as she took on her opponent. Not only did she refuse to wait her turn, but she creatively forged a new kind of coalition that energized voters out of their apathy and proved the wisdom of her impatience. And when Shirley Chisholm became the first black woman elected to Congress, she made it clear she was just getting started. Still, this whole first thing can be tricky. The holders of the distinction are proud to have broken the barrier, of course, to bring others joy and to be the shoulders that future leaders will stand on. But they also recognize that, no matter what they go on to do, the first sentence of their obituary has already been written. The goal for them becomes getting enough done to expand the scope of that first line — to add even more nouns and verbs of significance to their biographies. Alex Cora spent the last year balancing those same blessings and burdens while managing the Red Sox. It started when he got the job — the first person of color to lead the team in the history of a franchise particularly burdened by the sins of the past. Showing little desire to negotiate salary perks — he accepted the low end of the pay scale — he focused on securing a commitment from Red Sox ownership to fly relief supplies to his hurricane-ravaged hometown of Caguas, Puerto Rico. While he took satisfaction in the Puerto Rican pride his appointment unleashed, he made it clear none of it would matter unless he did his job well. In Boston, he and everyone else knows, that means delivering a World Series. 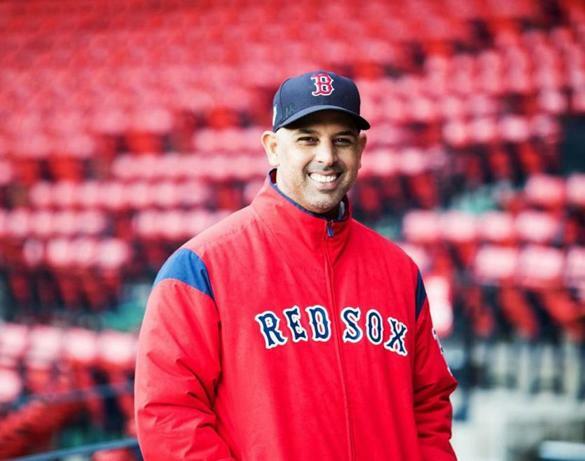 Cora did that and more, injecting into his job a refreshing blend of humility, risk-taking, honesty, and accountability, and working to be an effective bridge between players and management. (The team’s principal owner also owns the Globe.) In the process, he became only the second Latino manager in baseball history to bring home a World Series trophy — and the first manager in Sox history to do it as a rookie. As long as Cora is the guy in the hoodie calling the shots in the dugout, he will keep his eyes fixed on the future. As with Pressley, the chase for more nouns and verbs goes on. For blazing a new style of leadership that is bold yet inclusive, innovative yet respectful of the past, risk tolerant but grounded in smart strategy, Ayanna Pressley and Alex Cora are our Bostonians of the Year. Although they work in different spheres, they share a determination to be not just firsts, but firsts with a purpose. 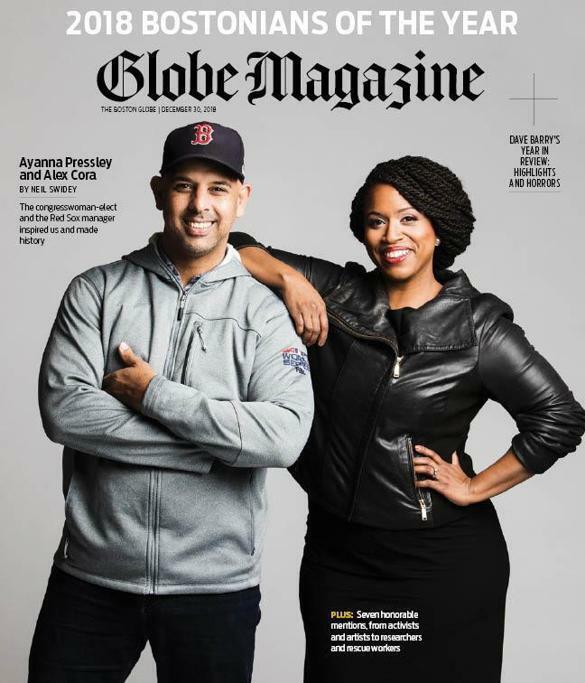 Alex Cora and Ayanna Pressley share honors as 2018’s Bostonians of the Year. The congresswoman-elect and the Red Sox manager inspired us and made history. He also makes sure there’s more than baseball in his life. He and his fiancée, Angelica Feliciano, and their 1-year-old twin boys split their time between Chestnut Hill and Puerto Rico. He also remains in close contact with his 15-year-old daughter and 23-year-old stepson from his first marriage back in Puerto Rico. Cora’s innovative “rover” approach — strategically using his starters out of the bullpen — broke enough norms in baseball to have the guys in the broadcast booth reaching for the Mylanta. But the willingness of all the starters to step up at any moment underscored the culture of genuine teamwork under Cora. I tell him the first time the Globe Magazine named a Bostonian of the Year was 2004, when Theo Epstein got the nod for helping the Sox reverse the 86-year-old curse. At the time, Epstein told me he saw 1918 “as the end of the first era of Red Sox dominance. They won five World Series from 1903 to 1918. They were a dynasty. It would be terrific if we could get back to that.” His aspiration seemed just south of ridiculous. Yet if Cora can lead the team to another title next year, the Sox will have exactly matched their dynastic record from a century ago. I was with Pressley on election night, when she seemed nothing but sociable while working a room full of supporters at the Fairmont Copley Plaza. She would do the “selfie shuffle” — walk two paces, get stopped by a fan, offer a warm hug, pose for the camera — and then repeat the sequence, over and over. But when we moved into a backstage area where Democratic pols gathered before or after addressing the main crowd, I saw a different Pressley emerge, one who resembled the studious child she once was. While most of the other headliners made the rounds, boisterously chatting with each other and aides, Pressley exchanged hi’s and hugs but, for more than an hour, largely kept to herself in the corner. She was easily the most talented orator on the night’s bill — with a few exceptions, the competition was far from stiff — but she was also the one who spent the most time backstage painstakingly editing her speech. “Trying to get it just right for the moment,” she told me at one point. When she finally took to the podium and immediately lit up the crowd, I wondered how surprised people would be if they had just witnessed the quiet, studious version. While some critics have accused her of filtering everything through her lens as a black woman, she says, “It’s not just about my lens. It’s about the people I listen to,” whether that’s a bicyclist trying make the roads safer or a restaurateur trying to keep a small business afloat or a parent trying to cope with the loss of a child to gun violence. “I am a consensus builder,” Pressley says. “To build coalitions is inconvenient. It is much easier to just surround yourself with a completely homogenous network of people who drink your Kool-Aid.” But groupthink produces terrible policy. WHEN SHIRLEY CHISHOLM DIED, in 2005, the first line of her obituary in The New York Times pointed out that she was “the first black woman to serve in Congress and the first woman to seek the Democratic presidential nomination.” Yet the article failed to mention most of her biggest achievements in office, from helping to launch the Special Supplemental Nutrition Program for Women, Infants and Children (WIC) and expanding opportunities for women through Title IX legislation, to cofounding the Congressional Black Caucus and the National Women’s Political Caucus. 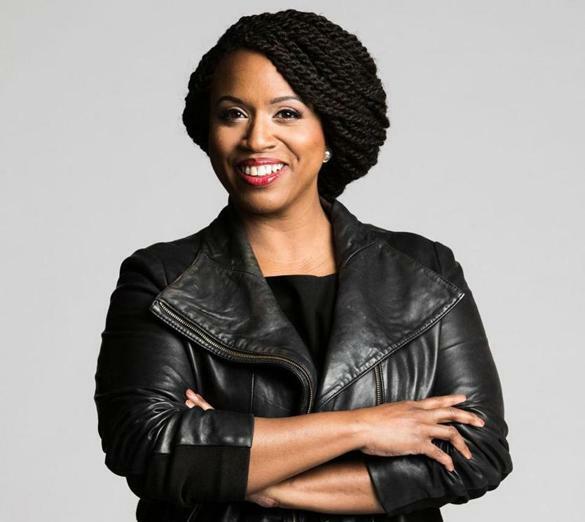 Ayanna Pressley and Alex Cora still have lots of time to build on their remarkable starts. But this much we know: Some version of that same closer would already apply to both of them.